Maruti Ertiga received a 2019 upgrade, getting bigger dimensions in comparison to the older model. The car now measures 4,395mm in length, 1735mm in width and 1,690mm in height. The wheelbase is quite fascinating at 2740mm. The seven-seater is definitely the most affordable version of its kind, rivaling the newly introduced Mahindra Marazzo in its segment. The car weighs just 1240 kg, making it equally eligible for decent mileage through the petrol engine. In the diesel version, the smart hybrid technology helps Ertiga claim 25.47 kmpl of mileage. Mahindra Marazzo, on the other hand, weighs 1680 kg and comes with even bigger dimensions. The car measures 4,585mm in length, 1866mm in width and 1,774mm in height. The huge dimensions make Marazzo a more comfortable people mover than the Ertiga. 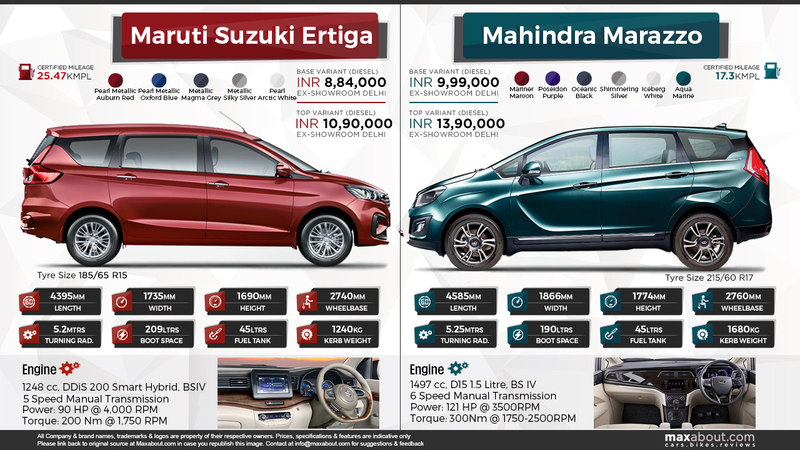 The 1.5L engine on the Marazzo is good for 121 HP while Ertiga comes with a 90HP, 1.3L engine.